Many people are surprised to learn about how many common household items our upholstery cleaning team can take care of for them. While most people know that we can deep clean chairs and sofas, they might not know that we can also clean their throw pillows, mattresses, dining room chairs and much more! If you have been putting off cleaning these items because you weren’t sure how to do it or how often, AA Super Klean is here to help. Check out our recommendations about how often you should be cleaning these common household items! Your throw pillows go through a lot and are typically handled more than the other cushions on your couch. For that reason, they’ll need to be cleaned more often. We recommend having them done twice a year. Some less expensive cushions can be thrown into a front-loading washing machine to be washed. If they have any decorative items or were made from synthetic fibers, you are probably better off having them done by a professional upholstery cleaning team. This will protect the decorative elements and prevent the pillows from becoming misshapen. Mattresses can get pretty gross. They hold our sweat, dead skin, and sometimes creepy pests that we’d rather not think about. Having your mattress professionally cleaned can help remove some of those items and sanitize the mattress so you can sleep soundly. Have this done once a year, and mark it on your calendar so you don’t forget. If you have upholstered dining room chairs, you know how messy they can get. If you have kids and upholstered dining room chairs, you know how quickly it becomes a nightmare. We recommend having your dining room chairs cleaned at least once a year and probably more often if you have children or do a lot of entertaining in your home. This will get rid of food stains and keep the chairs looking like new. Curtains are great for blocking out the sun and adding a little style to your space. They are also the perfect place to harbor allergens, dirt, and dust. That’s why you should ideally have your curtains professionally cleaned once a year, or more often if you are particularly sensitive to allergies. This will remove the allergens that are stirred up every time the curtains are moved and help you breathe easier. Your area rugs probably get more wear and tear than you carpet does; after all, that’s why the area rugs are there. You should have your rugs done as often as you have your carpet done. For most households, this is a once a year chore. For others, especially those with children or pets, twice a year cleaning is better. Just like it does with your carpet cleaning, having your area rugs cleaned professionally will restore the fibers and make the rug look like new again. How long has it been since you’ve had these items cleaned in your home? If it’s been a while (or you can’t remember the last time it happened!) get in touch with our team. We’ll give you a complimentary quote on the upholstery cleaning services that you need for every area of your home. It’s a great idea to schedule all of these services at the same time and try to get them all done together every year. This will help the items in your home last longer as well as make your home a cleaner place to live. 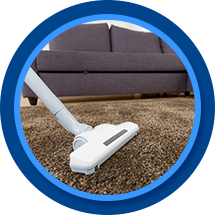 We’re experienced with upholstery and carpet cleaning of all types and offer competitive pricing. Get in touch with us today to get started!